Ever had a car break down with no other way to get to work? How about an unexpected medical expense? Want to fly home to help out in a family emergency, but don’t have the cash on hand for a plane ticket? In all of these instances, you should turn to your emergency fund. Ideally, you already have one that holds enough money to cover 3-6 months of expenses. Realistically, though? Only forty-one percent of Americans turn to their savings account in a time of financial emergency. That means that over half of us are using alternative methods to get through rough fiscal periods, and all too often we look at high-interest financing as the solution. In these situations, one of the better solutions is a personal loan. They can be used for just about any expense you may incur and the interest rates tend to be significantly lower than other financing options. Let’s compare. If you have a line of credit available to you, it really can be a lifesaver. Charging your emergency is only viable, though, if you can pay it off in full before it accrues any interest. Many credit cards charge 15.99%-24.99% APR. Currently, PenFed Credit Union offers personal loans for rates as low as 9.99% APR. That’s a major difference in interest rates. On top of that, when you take out a personal loan, you’re paying a fixed balance. Every month that you pay your fixed monthly payment, your balance will go down and a set portion of your payment will go towards interest. Credit cards have no fixed monthly payments. While minimum payments are required, these amounts are dependent on your balance. If you can pay your balance off quickly, you’ll pay less interest than if you only chipped away via minimum payments. But if you could pay it off quickly, you probably wouldn’t be charging an emergency in the first place. Sometimes you may not be able to charge your next big expense. Let’s say you spent $1,000 on your latest emergency, but now you need to pay rent. It is also $1,000, and because of your own series of unfortunate events, you don’t have the cash on hand to write the landlord a check. In these situations, there is a common temptation to yet again pull out the credit card—this time for a cash advance. This is even less advantageous than charging your card. Cash advances typically come with associated fees. They also charge interest. While the rate is usually the same as for traditional purchase, you don’t have the luxury of waiting for your statement to close and become due before interest accrues. On cash advances, interest starts building up the day you make your purchase. So to review, with a cash advance, you’ll start incurring interest right away, making it more expensive than charging something to your credit card as a purchase. In many situations, you’ll also have to pay cash advance fees, making it even more expensive. Because the personal loan in our example is cheaper than purchasing on a credit card with minimum payments, it is most certainly cheaper than doing the same with a cash advance. 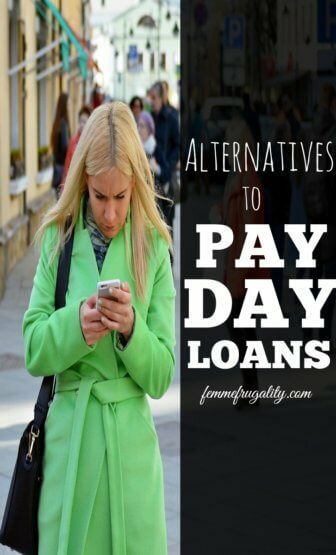 If it is ever at all humanly possible, stay away from payday loans. Their interest rates are usually significantly higher than personal loans offered by credit unions or banks. Also, the computed interest rate could be triple digits. For example, you may see rates advertised as a “low 15%”, but what these companies don’t advertise is that the interest is charged weekly. That makes your effective APR 400%. Exhaust the personal loan option first. Remember in our example that the effective rate on a PenFed personal loan is as low as 9.99% APR, and the payment structure is far more reliable than payday loans, which often balloon even higher with excessive fees that are unfortunately easy to accrue. Note: If you need to borrow less than $500, you may not qualify for a personal loan. That does not mean you should turn to a payday lender. Check out this alternative. If you don’t have an emergency fund, you’re obviously not alone. But that doesn’t mean you can’t start to improve your financial situation today. Even if you live paycheck-to-paycheck, you can start socking small amounts of money away quickly. If 3-6 months’ worth of expenses sounds like too big of a number, set a lower goal. Maybe $500. Maybe $1,000. Once you’ve reached your goal, by all means keep going. But by setting something achievable from the start, you’re more likely to stick with it. Fun fact: If you set aside $25 every other week, you will have a $650 emergency fund after twelve months—not bad! This post is in collaboration with PenFed Credit Union. Rate and offers current as of April 21, 2017 and are subject to change. Federally insured by the NCUA. This entry was posted in Money Management, Ways to Save Money on April 21, 2017 by femmefrugality. I’ve seen so many stories where people take out one payday loan and can never recover from it. It’s terrible. I hope people take your advice on this! Payday loans are really the worst. I feel so bad for anyone stuck in a position where they need the money that badly. This list is a really useful resource.